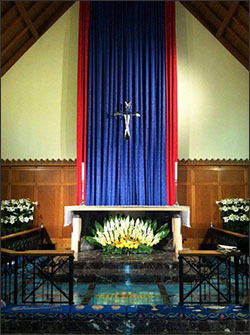 Whether you’re a lifelong Episcopalian or have little formal religious experience, welcome to St. Mary’s! One of the best ways to get to know us is to worship with us. We celebrate the Holy Eucharist (Holy Communion or Mass) at 7:30 a.m. and 9 a.m. each Sunday. The earlier service is quiet and reflective and lasts about an hour. The later one—which includes music—is about an hour and a quarter. Both include scripture readings, prayer and a sermon. Please see the Worship page for more information. Parking – Our primary parking lot is next door to the church on Park Street. (The Church Office building is located in the middle of the parking lot, 41 Park). Accessibility - Handicapped parking is located on Church Street and provides accessible entrances to the church and Anderson Hall. Four pews are modified to accommodate walkers, wheelchairs, or strollers. Accessible bathrooms are located in the church lobby (narthex) and in the entrance ramp hallway to Anderson Hall and education wing. Attire – Come as you are and what you feel comfortable in. Greeters – Ushers will be right inside the front doors to say hello and give you a service bulletin that lists the hymns, Bible readings, and prayers for the day. Ushers can also provide audio-enhancement devices. Walk up the center or side aisles and sit wherever you like. The Worship Service – Relax; our worship can be confusing to guests since we use a variety of worship resources. Ask someone near you to help you. Worship bulletins are available to help guide you through the service as well as provide notices of upcoming programs and events. The Offering – If you are a first-time visitor to St. Mary’s, you are our guest! Please don’t feel obligated to place money in the offering plate. Receiving Communion – You don't need to be an Episcopalian to receive Communion; all baptized Christians are welcome. You may stand or kneel. Generally, people receive the bread or wafer in their hand. Wine is received by a common cup (chalice). If you prefer not to drink from the cup, cross your hands across your chest. Refreshments – Coffee, tea and other light refreshments are served in Anderson Hall on Sundays following the 10:00 a.m. service. For ramp access to Anderson Hall, exit the church by walking out the left-hand aisle (past the organ), then re-enter the building using the exterior ramp.